Keith Richards, the guitarist of The Rolling Stones, says the band have met up for “a couple of rehearsals” as they mark 50 years together. Rumors of a tour to celebrate the band’s golden anniversary have been circulating for a number of years. However, Keith Richards would not go so far as to say when the quartet would be performing in public again. “There’s things in the works – I think it’s definitely happening,” he said. The Rolling Stones played their first gig at London’s Marquee Club on 12 July, 1962; and had their first hit, a cover of Chuck Berry’s Come On, 12 months later. A photography exhibition marking the band’s long career will be launched London’s Somerset House on Thursday. 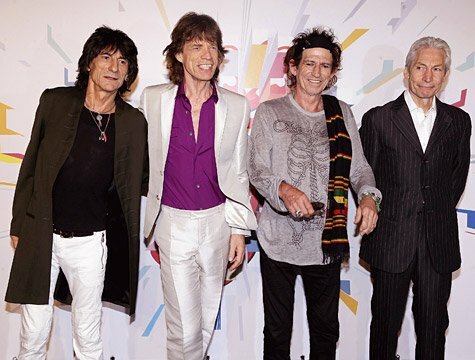 Talking about the pictures, which include reportage, live concert and studio images, Keith Richards said he felt “weird” looking back at the group’s early days. “It’s amazing – most of these pictures I think, <<where was the cameraman?>> I don’t remember them being there,” he said. He added he would like the band to continue for as long as possible, saying: “There might be life in the old dog yet – we’ll die gracefully, elegantly wasted. The Stones last world tour, A Bigger Bang, played to 4.5 million people in 32 countries over two years before it finished in London in 2007.